I just discovered your great "Orwell Today" web site and really enjoyed reading some of the material there. I intend to read more. We seem to be kindred spirits; your view of JFK is almost identical to mine, "1984" is my favorite book of all time, I think Paul McCartney is a sham while John Lennon was a genius and I think Joe McCarthy has been horribly slandered and was right about communist infiltration of our government. These are just a few of the opinions we apparently share. 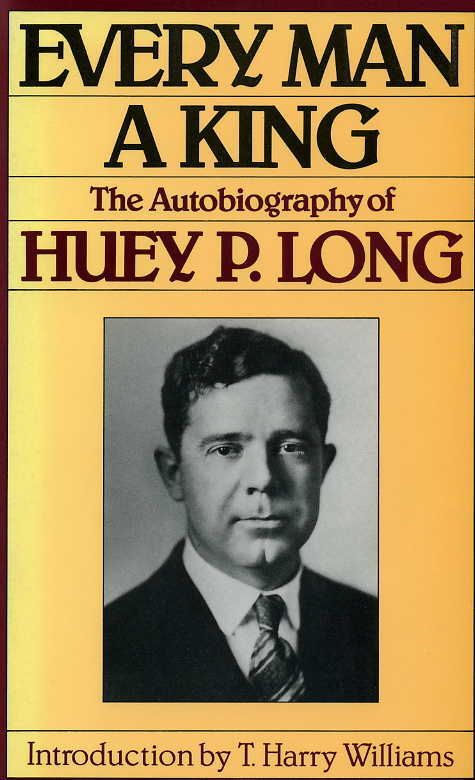 You even have a bit of stuff about Huey Long on your web site - the "Kingfish" is one of my all-time heroes. Anyhow, keep up the good work, and know that there are some of us out here who view the world the way you do. Thanks so much for sharing your kind sentiments about Orwell, JFK, Joe McCarthy, John Lennon and Huey Long. You no doubt understand the travesty of the latest hate-McCarthy production from the Ministry of Truth, ie the Clooney movie "Good Night, And Good Luck" which attempts to make a hero out of the CBS talk-show host Ed Murrow from the 50s. I'd venture to say that 99% of the people in every audience don't have a clue who Murrow was. McCarthy said he was a Communist. I forced myself to go and pay the admittance fee for the sole reason of catching a glimpse of McCarthy in the flesh as there was real-life footage interwoven into the phony-baloney stuff. But the footage they used was of course so edited that McCarthy's passion came across as a fault instead of an attribute, or in other words, it was used to portray him as a "wild man" instead of the wise man that he was. The audience I was with at "Good Night, And Good Luck" (Murrow's favourite line but I kept wanting to stand up and say "goodnight and good riddance") was recognizable as being of the "intellectual" type who consider themselves "morally superior" and "know it alls" and they were all feeling suitably smug when they left the theatre, aligning themselves with the anti-McCarthy propagandacist who was weekly given national airtime to pollute people's brains. As we were walking out of the theatre a "watermelon" acquaintance of mine (ie green on the outside, red on the inside) came up to me and said words to the effect "Wasn't that great?" to which I replied "I'm a fan of McCarthy" to which he responded by immediately changing the subject in classic crimestop manner, ie "instinctively stopping at the threshold of a dangerous thought". All week, prior to going to the movie, I had had to restrain myself from committing to the thought I had of standing in front of the curtain before it was raised and waving the latest book on Joe McCarthy I'd read and suggesting that people do some reading for themselves instead of getting their ideas wholesale from the super-size idiot box. The book I'm referring to is the one pictured above which, although written by someone who obviously despised McCarthy for his anti-Communism, at least stuck to the facts and is incredibly revealing in describing the greatness of Wisconsin's native son. 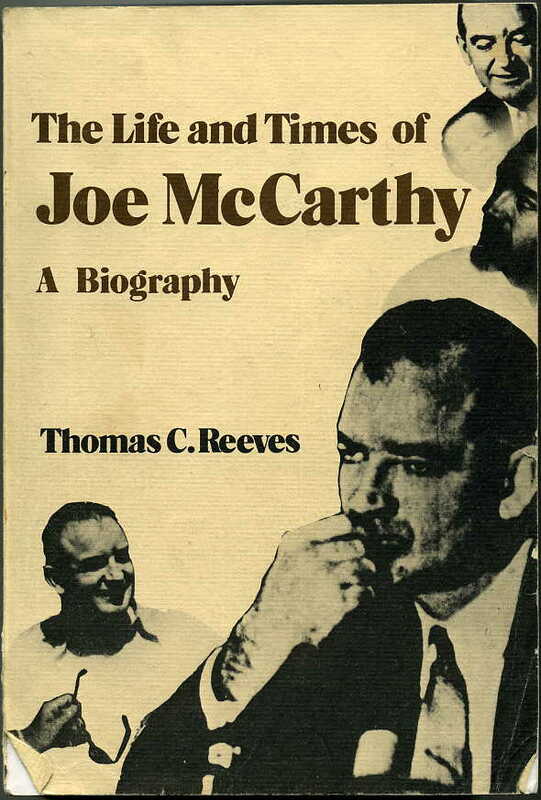 A person reading between-the-lines of its 675 pages (it's a tome) can arrive at their own conclusions as to how the powers-that-be destroyed Joe McCarthy. The bottom line is they infiltrated him with Roy Cohn, a tool of The Brotherhood if ever their was one. I've read a couple of books on him, ie THE AUTOBIOGRAPHY OF ROY COHN by Sydney Zion (his co-author) and CITIZEN COHN by Nicholas Hoffman. Dozens of people, including Robert Kennedy, told McCarthy to fire Cohn as his chief counsel but he was incapable of following that advice, so under Cohn's power was he. I'm happy that the Kennedys never abandoned McCarthy, even after he'd been discredited in the eyes of the nation by the machinizations of Cohn and Company and the gutter-press (a term Orwell coined). JFK, a Senator at the time (recovering from near-death back surgery) didn't vote to censure McCarthy and was hated forever for it. And Bobby Kennedy, a former member of McCarthy's Anti-Communist Committee, went to his funeral on May 6, 1957. It is my opinion, after reading WHO KILLED JOE MCCARTHY, by William Bragg Ewald, Jr that he didn't die a natural death. And WOW! I'm impressed that you not only know who Huey Long IS (as most people haven't ever heard of him and if they do, they think he's a rock band, ie Huey Lewis and the News) but you actually count him among your all-time heroes. I do too. I'm also impressed that you even FOUND my Orwell Today Huey Long section as it is somewhat buried in the WAS WINSTON SMITH GERALD SMITH? article, ie Huey Long and Huey Long's Share the Wealth and "Huey Long Is a Superman": Gerald L. K. Smith Defends the Kingfish. I believe Huey Long could have beaten Franklin Delano Roosevelt in the 1936 presidential election and I think that was the main reason he was assassinated. I arrived at this conclusion after reading between-the-lines in the book VOICES OF PROTEST: HUEY LONG, FATHER COUGHLIN & THE GREAT DEPRESSION by Alan Brinkley. Reading about Huey Long, including his biography pictured above, put Louisianna on the map for me. Prior to that I hadn't read much of Louisianna's history. The brutal assassination of Senator Huey Long on September 8th, 1935 in the Governor's office in Baton Rouge was in some ways a pre-cursor to the assassination of Bobby Kennedy some thirty years later in that the shots that did the killings didn't come from the men accused of firing them but came instead from the security guards there to protect them. And, like Bobby Kennedy, Huey Long lived for a time after he was shot, but then succumbed to his injuries, in his case infection from a botched operation to remove the bullets. In closing, it's great to have you as a reader. PS - I'm so glad you share my JOHN WINSTON LENNON SMITH sentiments. He was truly a rare human being and a gift to mankind in his own way. He will be forever remembered and forever missed. PPS - Other people I admire (who I haven't yet talked about much on the website) are Henry Ford and Charles Lindbergh, to name just a couple of other un-sung American heroes who have been villified and defamed for their patriotism and monumental achievements toward truth, peace and prosperity at home and throughout the world.